Believed to be one of the world’s 14 ancient dog breeds, the origins of the Samoyed are deeply rooted in Siberia where it was originally utilised by the peaceful Samoyedic people. Nomadic reindeer hunters whose livelihoods very much depended on how efficiently they worked the land, the Samoyedes came to rely heavily on their ‘white on white dogs’ to assist them in their inhospitable lands and ensure the survival of the people. In turn, the Samoyedes developed the breed and harnessed its qualities for later generations, utilising the dogs alongside their reindeer for better productivity. How the dog got its name is no coincidence when you consider the history – in fact, the dogs came to symbolise the Samoyedic culture and were highly revered as a result. Recent DNA analysis suggests that the Samoyed has been bred and trained for atleast 3,000 years. 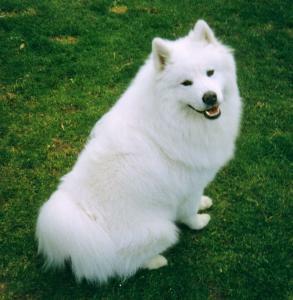 Formerly known as the ‘Bjelkier’ dog, the Samoyed quickly established a reputation for itself as a skilled service dog, capable of working the harsh landscape for lengthy periods at a time. Untouched by the bleak, changeable weather and not short of willingness or stamina, there was no better dog for the jobs of the Samoyedic people. The Samoyedes themselves hailed the dogs for their capabilities and utilised them in all manner of tasks, from hunting and herding, to hauling heavy loads across the snow. Besides this, the Samoyed was a wonderful companion dog that was both friendly and trustworthy and would support the people through hardship. Unlike the Laplanders who favoured an all-black dog that could be seen more easily, the Samoyedes saw the beauty in their white Bjelkiers and continued to breed for this colour. Primarily used to herd the reindeer and protect them from predators at night-fall, the Samoyed developed keen instincts and became adept at alerting the tribesman to a problem. Their colouring also made them stand out against the reindeer - something which the Samoyedic people consided invaluable. It is no surprise that the Samoyed formed very close attachments to its tribe and was often entrusted to guard the children. On the one hand, the Samoyed was an ideal family dog whose tenderness and loyalty knew no bounds and, on the other, it was a dog capable of hauling up to 90lbs on sleds loaded with supplies, of fearlessly protecting against wolves and bears, and all whilst resisting the harsh Siberian winters.Their thick, insulated coats also made them perfect lap warmers for the women and children during the most frigid months. In summer, the Samoyed's work was far from complete and along with their regular herding jobs, the dogs would pull canoes along rivers and transport supplies for building and expanding the tribes' settlements. It wasn't long before explorers began taking notice of the Samoyed and looking to import it back home. When the Russians began exploring Siberia in the 17th and 18th centuries, they quickly understood the value of the Samoyed and recognised its unique attributes. On returning home, news of the 'white on white dog' soon reached the Tsar, who met its appraisal with pleasure. It was decided that a collection of these dogs would be brought back to Russia, while others would remain in Siberia to help transport Russian tax collectors on their rounds. From here, the Samoyed made its way to the West where it embarked upon a number of polar expeditions. In 1889, the Samoyed arrived in England and was met with huge enthusiasm. This spitz-type dog with its unmatched strength, intellect and versatility was the dog of choice for explorers such as Robert Scott who desired a brave and reliable animal to carry them far and wide within a favourable time-scale. In this incidence, the Samoyed was chosen over the Siberian Husky or Greenland Dog for its amiable temperament and trainability. Fridtjof Nansen, a Norwegian explorer, was the first to use Samoyeds in his expedition of the North Pole. Unfortunately, all of his dogs perished, as they did on subsequent expeditions when the explorers, through a great lack of knowledge and understanding, failed to meet the needs of the dogs and unwittingly put them in danger (i.e. tail bobbing and removing their coats). It is said that every western Samoyed can be traced back to an ancestor once used on polar expeditions. While it is one of the world's oldest dogs, the Samoyed remains one of the purest and has subsequently maintained most of its early (and hugely valued!) qualities that make it the breed we all know and love. - The Samoyed has a long, feathered tail that is perhaps one of its most distinguishing features. When a Samoyed sleeps, the tail curls over the head to protect it from extreme cold. Many dogs died on the polar expeditions because their tails were bobbed - doing this meant that the dogs were exposed to the elements and perished within 3 weeks. - Samoyed fur is often used as an alternative to wool. It is regularly claimed that clothing made of Samoyed fur is able to withstand temperatures below freezing. - The name Samoyed - Sahm-uh-yed - is thought to mean 'feed off themselves,' something which lent many to believe these dogs were cannibals. Alternative readings suggest that the name actually implies these dogs were self-sufficient and worked to feed their people. Historic records do indicate, however, that weaker Samoyeds were often fed to stronger ones on polar expeditions when food ran scarce. - There are believed to be less than 50,000 Samoyedic people left in the world.